476 Anno Domini. Romulus Augustus, the last Emperor of the Western Roman Empire, has been deposed by Odoacer. The last vestiges of the first and greatest unifying power of Europe are now in ruins. While the old western provinces of the Empire are now ruled by kings of Germanic lineage, the Eastern Roman Empire is solidifying its power, succeeding in preserving the ancient Roman legacy, but its frontiers are far from being at peace. On its most eastern edges, the House of Sasan has dissolved the old Parthian rule, and on its ashes has created one of the most powerful and influential powers of Early Middle Ages: the Sasanian Empire. A new age is coming, an age of transformation and bitter fights. An age of warriors and kings, of valorous emperors and generals. To whom will you swear loyalty? You can take part in the almost continuous warfare between the Byzantines and the Sassanid Persians in the East, and the Sassanids’ own troubles with their eastern neighbours, the Hephthalites and the Göktürks. You can lead the Avars to conquer a mighty empire north of the Danube, and to threaten the very existence of the Byzantine Empire – or you can defend against them. The dlc releases have so far been pretty consistent at about 3 months so hopefully we will see this for sale in June. Now the days are going to drag! This is what Byzantine Games is all about. hjc wrote: Fabulous, what a treat. Yes, it will give Calvary armies some infantry options. So they will have some flexibility in previously considered bad terrain. I am sorry to say that I am disappointed by this announcement. The truth is that this period does not appeal to me at all. On the contrary, I expected Faster than Eagles. certainly this is a subjective personal opinion, and respect for those who think otherwise. What is true is that FTE would have a lot of new models and armies. Meanwhile, in Age of Belissarius, I am afraid that the armies will be very similar in appearance and playability to the previous expansion. I hope to be wrong. Looking forward to the release! Now the game is really getting into some of the more underrepresented time periods in videogames. Can we expect more details about the expansion before the release? I'm especially interested in hearing how the dismounting (and re-mounting) will work and what units will be able to do it (and if it will be retrofitted for some older units). Also interested in how custom battles and sandbox campaign are going to be expanded. MVP7 wrote: I'm especially interested in hearing how the dismounting (and re-mounting) will work and what units will be able to do it (and if it will be retrofitted for some older units). Me too. I'm probably wrong but I suspect it will be a case of selecting a unit as either mounted or dismounted at the start of a battle, rather than having them dismount/mount up during a battle. Then again, if cavalry can change mounted status during a battle that would be interesting - what happens if/when riders are driven away/routed from their horses/camels/donkeys? Perhaps the mount/dismount mechanic has occupied the beta testers, as it seems to have taken longer than other DLC to test. I personally can't wait as Belisarius is one of my top 10 Generals and I find the period very interesting! We have bad experiences with previous wargames rules (e.g. early editions of DBM) which allowed units to dismount and remount at will. Also with allowing armies that rarely dismounted their cavalry (in open battles) to do so. These produced all sorts of unrealistic tactics. Therefore dismounting (and remounting) is only permitted during Deployment, and is confined to people who are historically recorded as dismounting in battle. (Not in sieges). Thus, for example, Lombard and Herul lancers can dismount in the game, but Vandal and Ostrogoth lancers can't. Sabir Hunnic cavalry can also dismount. 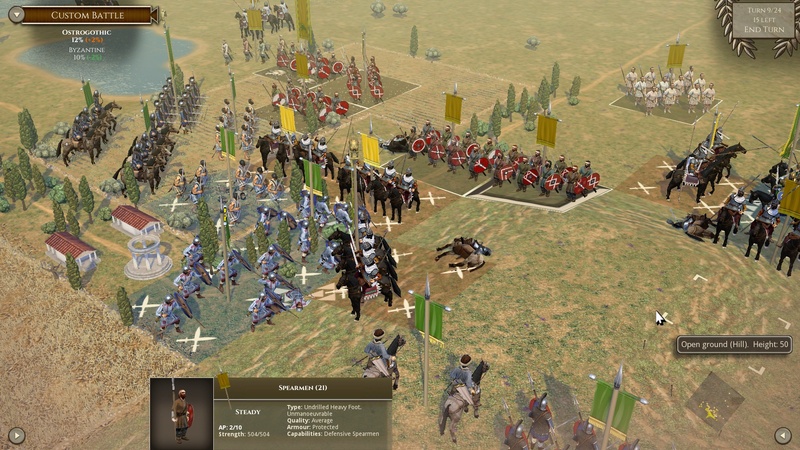 Dismounted Byzantine armoured horse archers exist in the game for the battle of Taginae, but they don't get to dismount in normal battles. When we go into later periods, a much higher proportion of mounted troops will get to dismount. rbodleyscott wrote: Therefore dismounting (and remounting) is only permitted during Deployment, and is confined to people who are historically recorded as dismounting in battle. Which all makes a lot of sense, thanks for the explanation Richard. shawkhan2 wrote: Myself would have been much happier to have seen Hittites, Hyksos, Assyrians, Babylonians and other truly ancient peoples depicted. 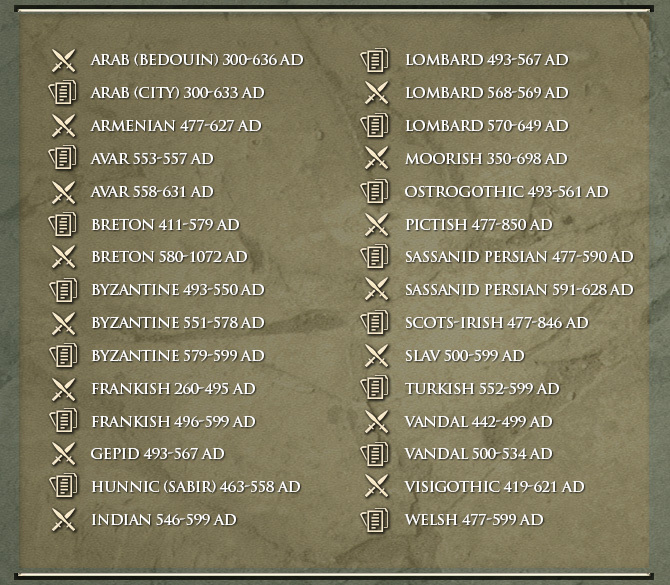 Even have Mycenean Greeks and Trojans, as just a few of the possible candidates. 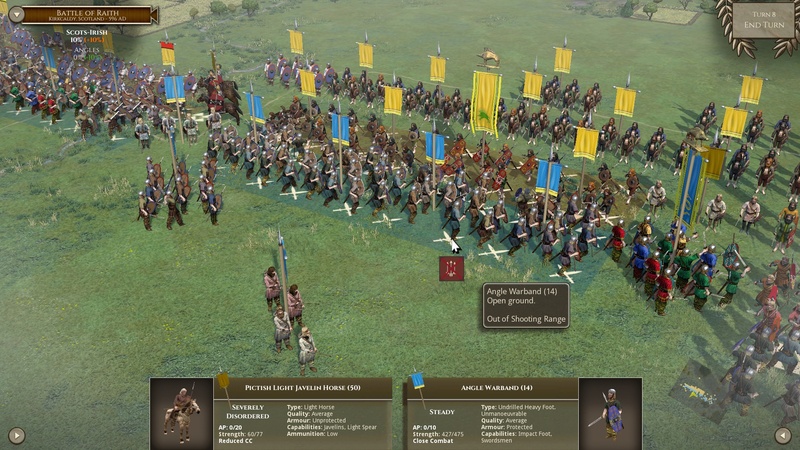 I agree that Age of Belisarius will be not much of an enhancement, which of course will not keep me from snapping it up the instant it becomes available. Yes to Age of Belisarius but The Bronze age yes yes yes.. I will also be a first day buyer of AoB, however with each release I sigh inwardly and hope that the next one will be Swifter Than Eagles. Having waited so long in vain for it to appear in FOG I I would love to know at least that STE will definitely come. How can a comprehensive ancient game not have the Egyptians, Assyrians, Hittites etc? The age of chariot warfare has so much to recommend it and would also offer something different from the other eras.